Do you need your chimney cleaned or inspected, and would like to ask a few questions? After you set up your appointment, our certified technicians will come to your home and thoroughly inspect your chimney before cleaning it. We will inspect the exterior and interior surfaces for cracks in the masonry and/or mortar joints, movement in any of the bricks, moss, and efflorescence, as well as checking the roof for any leaks around the flashing. Any occurrence of these can be a sign of deterioration and may require additional repairs. Upon entering your home, our technicians will use common courtesies to ensure that no additional dirt will enter your home, this includes wearing booties to cover shoes while performing the work as well as placing any protection down for your floors. To begin, the technician will access the firebox remove the valve plate if possible from the damper housing. Then using an assortment of tools and brushes, our certified technician will manually clean the smoke chamber and the smoke shelf where soot, creosote, and other debris have accumulated and then clean behind the damper to remove any remaining debris. The valve plate will be reinstalled with new cotter pins and the linkage, ash dump and glass door enclosures will be re-lubricated. Protect your family by inspecting your chimney flue once a year. A chimney inspection and cleaning will find any potential problems or blockages. Cleaning the creosote out of a flue will help your fireplace be more efficient and prevent a fire in the chimney which could spread to the home. The heat from a chimney fire will cause damage to the flue liners and allow gas to get inside the home. Cleaning the chimney with a hard brush will remove the build up of debris and keep your chimney safe and healthy. 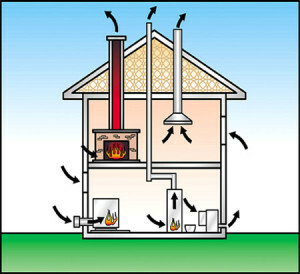 Your chimney system(s) are an important part of your home heating system. The National Fire Protection Agency and Manufacturer recommends an annual chimney cleaning of all chimney(s) by a reputable, experienced qualified Chimney Sweep. 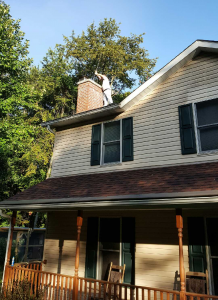 Chimney system(s) cleaning should be a regular part of your home maintenance schedule. If the appliance has a catalytic converter, it should be checked and cleaned a minimum of twice a year, once before the first burn and once after the last burn. To learn more about the benefits from our experts, call for details - 724-537-0070. Here is an in-depth article from the Chimney Safety Institute of America explaining how your chimney really works. We recommend this informative article to learn more about the function of your home chimney system. Chimney Safety Institute of America - A homeowner's guide to fireplaces, chimneys and wood stoves. Chimneys.com is one of the main sites making up the extensive presence of chimney sweeps on the net. It is a good source of technical information for homeowners and Professionals alike. Wood Heat Organization is a nonprofit, nongovernmental agency dedicated to the responsible use of wood as a home heating fuel. National Fire Protection Association is the authority on fire, electrical and building safety. Certified Chimney Professionals official website.